My office is cold. So, so, cold. Which means I need scarves. Plural. (And mittens, but thanks to my office secret santa I have those already). I'm digging the prints they have at Hayden Harnett, because anyone who loves a good trend is going to fall for the Aztec motifs and the Givenchy-inspired gothic florals. But what I dig even more is the fact that they offer bespoke prints, so you upload your favourite photo and have it made into a scarf. Lunacy dictates that I'd use a corgi image, but thankfully logic intervenes and a beautiful sunset or dark fashion print, a la We Are Handsome or Black Milk Clothing, seems more apt. Choose from a sheer chiffon or an opaque sandwashed silk. And exercise good judgment. i love finding new blogs. i just stumbled onto yours via a friend on facebook. now i have you on my own blog roll and i've liked you on facebook. i live in hong kong, too, so it's nice to read a blog to find out what's on and where to shop. 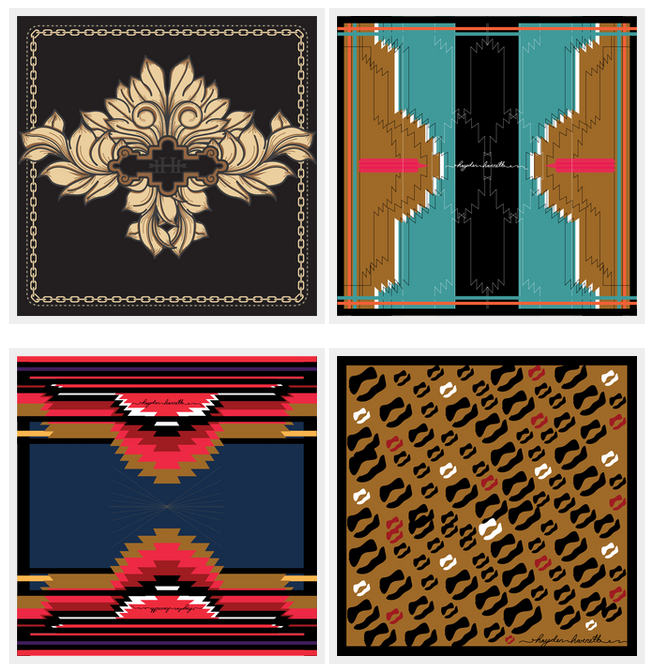 great prints on the scarves!